For proper operation VCP driver is required. It can be downloaded from http://www.st.com/web/en/catalog/tools/PF257938# or local copy: VCP_V1.4.0_Setup After installation connect the device, use terminal and have fun. Now the device can be used without PC. Power it with 5V, wait 10 seconds to start the autorun operation and make some “beaconing” online. Commands reference will be provided soon. Stay tuned. Different sets of commands are provided for adjusting the operation of the device: audio settings, timing running and repetition, message entry and controlling settings storage in internal flash. Where <Vol> is between 0 and 100. Where <Freq> is between 100 and 10000. Frequency and volume can be altered when audio generator is active. When enabled with AUD C 1 the tones will be heard during the CW. More characters will be added with future versions of the software. Where <Text> is any sequence of valid characters with maximum length of 64. To enter sequence for AR (end of message), simply enter <AR> into the message. It is even possible to insert any sequence of “dits” and “dahs” by simply insert sequence of E and T within brackets. will emit for time “C”, two times “S” and to times “O”, because <tete> is equal as C.
Timing mode of the message is set with MODE command. There are two modes for calculating the duration of the dot time. Entered numbers are converted to milliseconds. All stored values for dot time are in milliseconds. Two modes for entering the dot time are possible: Normal and Slow. When specifying speed in Normal mode, the unit is Word Per Minute (WPM), calculated from standard word PARIS, with the duration of 50 dots when PARIS is converted to dots, dashes and pauses using scheme indicated in the picture above. The formula for calculation from WPM to the duration of the dot in milliseconds is therefore DotTime = 60.000/(50 WPM). For Slow mode, the unit is millisecond. Dot time in Slow mode can be from 1000ms to 100000ms. Where <t> is time entered in WPM for Normal mode and milliseconds for Slow mode. Message timing mode is displayed when MODE command is entered without parameter or parameter “D” is used. Message generation can have two parameters set: the period of the message (marked with blue line) and number of repetitions. Number of repetitions can be set to some integer number or zero for repeating message infinitely. Note! When specified period is shorter than complete message duration, the next message will follow after 7 dot time units. This is the same when period parameter is 0. Note! When repeat number is set to >0, the device will stop generating morse code when specified number of repetitions are reached. To restart the sequnce, the device should be restarted using power cycle or reset signal. When all required parameters are set, the sequence can be tested or run with the RUN command. The command doesn’t require any additional parameters. Note! Settings can be altered when generator sequence is running, but it is highly recommended to stop the execution when changing the message and then run again. Internal storage has room for storing up to eight settings. Before storing the current setup, some identification must be provided. The ID command is used to set the identifier to the current setup. The setup will be stored and cataloged under the name provided with ID command. The catalog is displayed with CAT command. Storing and loading the settings to /from the storage is done with STORE and LOAD commands, respectively. Individual settings can be deleted with command DEL. And finally, the settings can be marked for auto-run after power-up with the command START. All commands except ID and CAT accept numeric parameter from 1 to 8 indicating location from 1 to 8 within internal storage. Where <n> is number of the storage location from 1 to 8. Where <n> is type of autorun option. “0” denotes no autorun, “1” is for unconditional autorun and “2” is for selectable autorun. 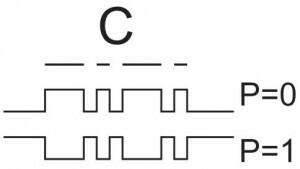 There are three input pins (PA1, PA2 and PA3), which can be set to 8 different combinations. When this combination match the catalog number-1 and the option “2” is set at the same time, the settings will be loaded from the storage and run accordingly to stored parameters. When optin “1” is selected, the first entry in the catalog having optino “1” set will be loaded and run during startup. 2:        2 -  a.V=0%  a.f=0Hz  a.cw=0 CW.t=0ms  CW.msg :''  Out.p=0  Out.cw=0  AR! 3:        3 -  a.V=0%  a.f=0Hz  a.cw=0 CW.t=0ms  CW.msg :''  Out.p=0  Out.cw=0  SAR! I willbe unABLE TO RUN AND PRIGRAM ……BUT WILL BE WILING TO PURCHASRA PROGRAMMED READY TO USE . Or find the address to buy the mini USB dongle with SMT32F0xx and facility of this element instructions. Powered by Pavlin.SI 42 queries. 0.356 sec.